Almost exactly two months ago I cut the bottom of my right foot on the outside edge. The cut was fairly small (slightly less than half an inch) but seemed a little deep. I washed it thoroughly and it stopped bleeding relatively quickly so I decided to not go to the hospital. The cut was extremely painful when first stepping on it. I tried to avoid stepping on it but was moving, etc, so could not avoid it completely. The cut has closed nicely, but the area remains swollen and very sensitive when stepping on it. I went to see a doctor 3/4 weeks ago who told me that there is nothing in it and that it just takes time to heal. He said that liquid from the bleeding must have accumulated and takes time to disappear. The pain is duller now but more constant when I walk. During the first month and a half, I would get very sharp pain some times, depending on how I would step. I have no pain when the foot is not touching anything. When softly massaging the area with my thumb, it still hurts a lot if I move my thumb from the outside toward the inside of the foot, but very little in the opposite direction. It has been two months already and I can still not completely walk properly, let alone run. Is the pain caused by the scar? I am not sure why it hurts only in one direction when massaging, or why the area is still quite swollen. What can I do to help the healing process? I try to avoid stepping on it and keep my foot warm. Because of the nature of feet, the fact that we have to walk on them, injuries to them can take longer to heal. If you had cut your hand, for example, you might not even notice the problem. your foot. It is a little too early to be talking about scarring, but that has to be entertained as a possibility, particularly if you or others in your family have a tendency to form scars. The fact that the area is still swollen could possibly be simply from the inflammation caused by walking on the area or it may indicate the possibility of a foreign body. Do you remember what you stepped on to cause the cut in your foot? If it was a sharp object like glass, or some form of metal or wood, there is a possibility that a portion of that material lodged itself in the cut and even though the cut closed, there simply may be something inside. If a patient walked into my office with a similar complaint, the first thing I would do is order an ultrasound to see if there is any foreign body within the wound. An x-ray alone will not do it as certain foreign bodies (such as unleaded glass) will not show up on an x-ray. If the ultrasound were to show some sort of foreign body, then I would open up the area and try and remove it. This would probably have to be done in a hospital out-patient setting as a tourniquet would be needed in order to control bleeding since small pieces of a foreign body can be difficult to remove once a wound has closed. Assuming the ultrasound was negative for any foreign body, then I would assume the problem is excessive inflammation (which could lead to scarring). In this instance I would consider injecting some cortisone into the area to reduce the inflammation. As a side note, prolonged inflammation could also be a sign of an infection, but the area would tend to be red, hot, as well as swollen. From your pictures it does not appear that way, but I cannot guarantee it. A good local doctor should be able to tell if there is any sign of infection. Turns out there was a small piece of glass in my foot. It was difficult to see because transparent. Once removed, it was all gone in 3/4 weeks. I would say if your swelling doesn't dissapear in a couple of weeks or you still get a sharp pain from time to time when stepping, most likely you have something inside, that you need removed. Oliver - I have the exact same issue. 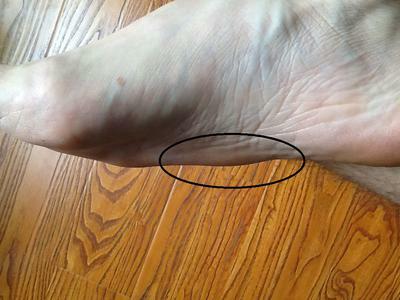 How long did it take for the swelling to go away and for you to walk properly? The doctor here performed an ultrasound and didn't think there was something in it. I don't think it is infected, as the area is not hot. I should just be patient I guess.